Fig. 9. Semi-quantitative assessment of aortic regurgitation severity by the vena contracta width. Note the three components of the aortic regurgitant flow: the flow convergence—above the orifice, the vena contracta—through the orifice, and the regurgitant jet—below the orifice. consistent with moderate aortic regurgitation, whereas a vena contracta width greater than 0.6 cm indicates severe aortic regurgitation (Fig. 9). Visualization of the color jet of aortic regurgitation on the parasternal short-axis view is another method for quantitation of the severity of regurgitation (Fig. 10A). The regurgitant color jet area can be measured and compared to that of the left ventricular outflow tract with the result expressed as a percentage (Fig. 10B). Using this simplified area ratio method, patients with mild aortic regurgitation have ratios of less than 5%. Severe aortic regurgitation occurs when ratios exceed 60%, with a broad range between 5 and 60% indicative of moderate aortic regurgitation. 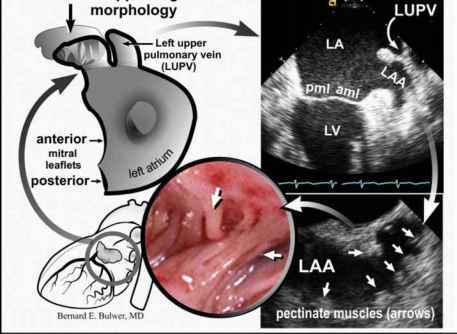 The color jet disturbance of aortic regurgitation is also easily visualized from the apical windows (Fig. 11 A; please see companion DVD for corresponding video). The color jet length and area, however, are less proportional (in these views) to the degree of regurgitation and are more influenced by the aortic to left ventricular diastolic pressure gradient as well as interactions between the regurgitant jet and the outflow tract walls (Fig. 11B, please see companion DVD for corresponding video). The color jet width is occasionally measured from this view but the parasternal projection provides better axial resolution. Fig. 10. (A) The color jet area measured from the parasternal short-axis view (PSAX) is proportional to the regurgitation orifice area. In these images, color from the aortic regurgitation (blue) is seen centrally, but varies throughout diastole owing to a changing orifice area (please see the companion CD for the video). 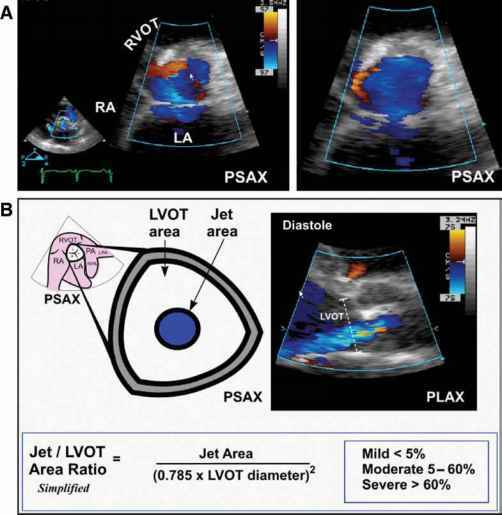 (B) Semi-quantitative assessment of aortic regurgitation severity by color flow Doppler assessment (simplified jet/left ventricular outflow tract [LVOT] area ratio) using PSAX. pressures. Accurate measurement of pressure halftime is also dependent on obtaining a well-visualized signal from the regurgitant jet. Patients with small volumes of regurgitation or poor windows may have incomplete spectra making measurement of this measurement difficult. Calculation of regurgitant volume and regurgitant fraction provides a better quantization of the severity of valve insufficiency (Fig. 15). The regurgitant volume is equal to flow out the aortic valve (aortic stroke volume) minus flow through the mitral valve (mitral stroke volume). Calculation of regurgitant volume requires measurement of the left ventricular outflow tract and mitral annular diameters, as well as velocity time integrals (VTI) of flow through the left ventricular outflow tract and the mitral annulus. Aortic flow is equal to pi (n) multiplied by the square of the radius of the left ventricular outflow multiplied by the VTI of aortic flow. Mitral flow is calculated as n multiplied by the square of the radius of the mitral annular diameter multiplied by the VTI of mitral flow. Mild aortic regurgitation is considered when the regurgitant fraction is less than 30 mL/beat, moderate-between 30 and 60 mL/beat, and severe regurgitation—in excess of 60 mL/beat.